I’ll admit it, I didn’t start decorating for Halloween until this last weekend. Sometimes life, and the forgetful brain, get in the way. I had that “Oh No” moment when I walked into a store and saw their Halloween display towering down at me with laughing animatronics, creepy ghosts, and nasty spiders. Oh the eight-;egged creatures of doom, those are never allowed in my Halloween display. nope nope nope. On the plus side, I didn’t have the Halloween brain fart last until Oct 30 where I could have been scurrying around in a desperate need to find trick or treat candy and some pull-together costume made from pop cans and a green cardboard box (recycling hahahaha). I have time to be a little creative with the family. So what did I do? Well I sought shelter in my Photoshop program and immediately began to create DIY decorations. This year I am going simplistically cute with a small factor of creepy with my fun #FollowMeEyes creations. 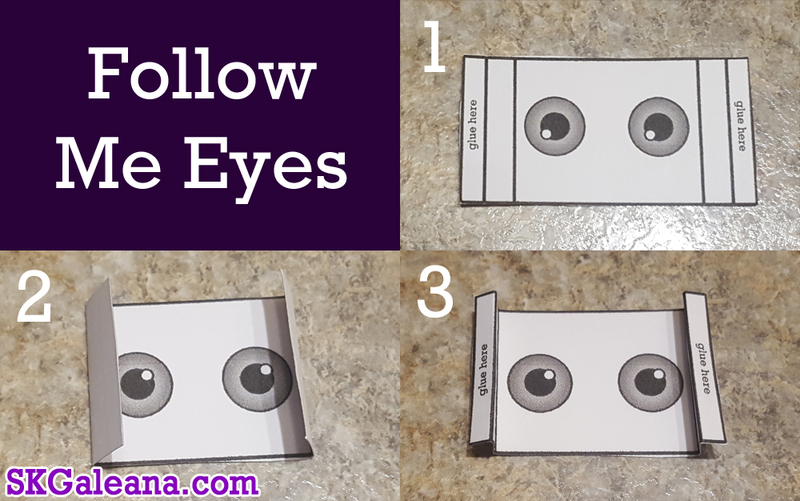 This time, instead of being Cubeecrafts with the Cubee-Follow-Me-Eyes, the printable Halloween Decoration is a Ghost Puppet. These Ghost puppets can go almost anywhere. The Ghost Puppet/Decoration is pretty simple to create and will be fun for the whole family. Simply follow the instructions below. Be sure adults do all the cutting. Cut out the ghost along the outer solid line, be sure not to detach from base. Wrap the base around to form a circle and glue together. The circle should form behind the ghost. cut out the desired eye rectangle along the outer boarder. To get a copy of the Ghost Paper craft click the image below and save the PDF to your computer. Then print, create and Display.